After a few weeks off from Target, I finally went today. I had planned to go to Publix but I really don't need anything after my two trips earlier this week and I want to wait for the new advantage flyers to start in a few days before I head back. All I really needed in the grocery department was a specific kind of cake mix for a recipe I am trying out this weekend. Since I wanted to check out a few deals at Target I decided to go there instead of Publix. I really went in for the Dial and the toothbrush gift card deal but I stumbled upon an amazing deal on Glade Expressions Fragrance Mist. I had received an amazing coupon book full of Glade coupons as a member of Bzz Agent and although I had given most of my $2 coupons away to family and friends I had a few left. I also had printed a few of the high value $2 coupons from this link on a few different computers so I had eight of them in various forms with me in my coupon folder today. I my typical souring of the clearance racks I was able to find TONS of the fragrance mists on clearance. They were marked down to $2.48 but rang up $1.48 making them free plus a .50 per bottle money maker. Since Justin was with me I was able to have him buy four and I bought four so we could stay within Target's coupon policy. 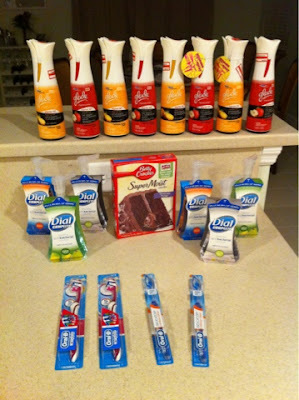 He was able to also apply his overage to the Dials and me to apply mine to the toothbrushes and cake mix making our whole trip next to nothing after coupons, overage and a $5 earned gift card. I also had a completely free Publix trip on Tuesday and a $27 Publix trip on Monday. That means I am way under budget for the week which is perfect since we are planning on spending about $15 at the farmers' market on Saturday and hoping to put some extra grocery cash away towards some savings goals too. We have been doing a really good job eating out of our freezer and stockpile and we are going to challenge ourselves to continue to do that until Easter. It has been nice to spend less at the store on basics while still getting to shop the super deals and stock up on household items while we aren't purchasing as much in the grocery department. I am really finding that it works for me to focus on things in cycles spending a few months stocking our pantry and freezers while not buying household items and then flip flopping it every so often. Made them all FREE plus a $4.16 total money maker!